While building Jatheon Archiving Suite, we wanted it to be outstanding. That’s why we put extra effort into our search functionality and made sure all our appliances contain enterprise-grade hardware. Here are some of the features that make our solution stand out. Offers protection against undetected data corruption and crashes. Ensure enterprise flexibility and cost savings not possible with traditional storage and improve overall IT performance. Prevents whole-disk failures and detects and corrects silent data corruption. Search terabytes of data in seconds and extract information instantly. Increases dependability and stability and prevents appliance shutdown or failure. Premium hardware with added security of monitoring and reporting of all physical interactions with appliance. Expand available storage without purchasing a whole new appliance. Capacity to index and archive high volumes of email in near real-time. Mitigates any opportunity for user deletion. Ensures absolute data integrity within the archive, providing worry-free dependability. Detect data corrupt errors and verify overall data integrity for added peace of mind. Prevent data loss due to physical errors, bit rot events and data corruption. Complete control of the storage system. Self-healing technology continuously repairs damage caused by deterioration of magnetic media. Extract precise information with the confidence of knowing it is accurate and current. Provides greater space for files while improving administration and data security. Easy-to-master, intuitive interface. Quick and advanced search functionalities. 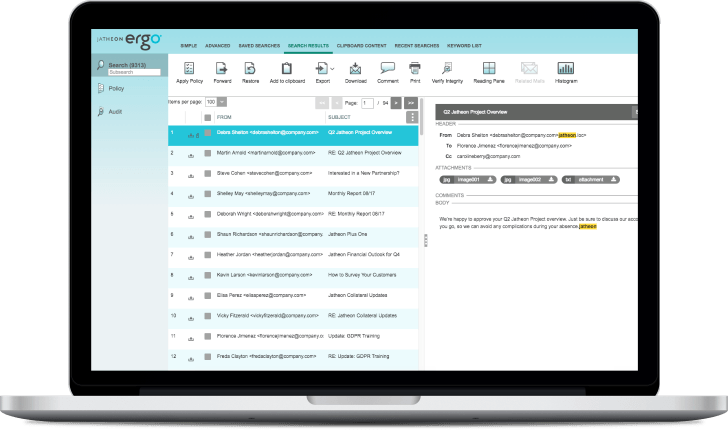 Create and execute complex searches by filtering emails matching certain criteria, keywords or phrases. Easily grant permissions to users and allow them to search through teammates’ mailboxes. Review the list of recently conducted searches even if you haven’t saved it. Control access to archive by specifying user roles and assigning permission levels. Automate the deletion of emails after retention period expires and exclude specific emails from the deletion process. Archive only one instance of an email and attachment to optimize disk space usage. Prevent the deletion of specific emails and exclude them from the global expunge process if you have a legal request. Review all user activity, gain insight and prevent data tampering. Easily import and synchronize users from MS Active Directory, Novell eDirectory, Domino, Gordano, Redhat Directory Server. Simple import of legacy data stored on a local shared drive. After getting search results, select and forward selected emails or restore them to original mailbox. Export messages to pdf, pst and eml file formats. Export very large amounts of data using advanced export. Get easy access to your Exchange folders directly from the web interface. Offers Outlook users the familiar experience and lets them access and search the archive directly from Outlook. Get insight from your data: volume, average values and overall statistics in the format of your choosing. Get free 24/7 remote monitoring and proactive response to hardware, software and connectivity issues.